New to this? Click here. Caribbean Plaza is thematically one of the most complex areas of the Magic Kingdom, not often commented on (except by me, of course...). This grouping shows two of the most distinctive features of the Plaza evident as you first enter, the tile roofs (how often have you overlooked the little flying bird on all of the ends of the tile roofs?) and the sudden introduction of planters which hold back the jungle with formalized iron boxes and rails. The illusion of a fortress just on the outskirts of a jungle is very strongly felt in the transitory area from the Jungle Cruise to the Plaza, aided in no small measure by the Jungle Cruise just next door. 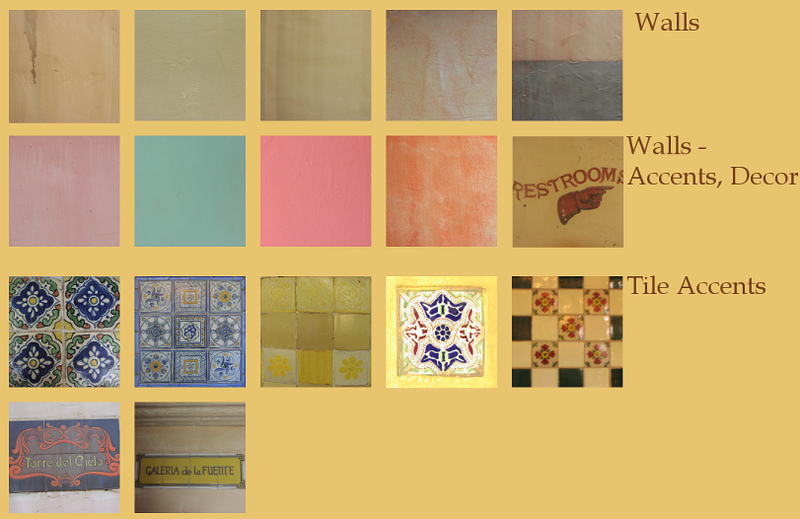 Caribbean Plaza is basically a labyrinth of earthtone plaster walls, many accented with dark aged stains or tropical-colored accents. Although the vegetation around the plaza has grown in quite a lot in the last thirty-seven years and so the effect of being massive and sunbleached has been greatly diminished, the little tile accents and placemarkers still retain much of their charm. Supposedly these tiles were imported especially for the project. The plaza uses dark woodtones to contrast the plaster, exposed rafters under the tile roofs and intricate carved woodwork designs on doors and walls. All this dark wood creates interiors as dim and romantic as the exteriors are sunsplashed and dramatic - a fitting prelude to the dark, dim Pirates of the Caribbean anchoring attraction. Few areas of the Magic Kingdom are as receptive to a slowly setting sun or a bright twilight. I don't think any area of the Magic Kingdom has such an impressive array of paving details, from the odd little lines which run through the streets to the richly detailed cobblestone effects achieved elsewhere. Because much of the Magic Kingdom is finished with plain red concrete paving tiles, the use and variety of paving details here is especially noteworthy. A paving flourish right past the Tiki Room even announces the arrival of the area, and an intricate design below the large signature arch which is the back of the area heralds its departure. In later years Disney would contribute significant attention to the paving treatments in their parks, an effort Caribbean Plaza would predate by nearly 25 years. Few areas of the Magic Kingdom are as lavishly detailed, as these final few groupings demonstrate. 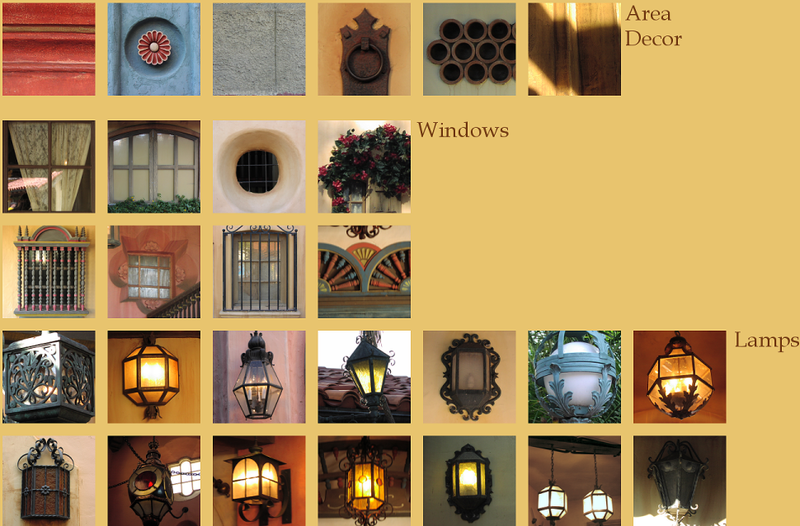 Such an amazing variety of lighting fixtures, with no two almost ever re-used! If there is a complaint about Caribbean Plaza, it is that it is a little too clearly an afterthought to the Magic Kingdom - it could have benefitted from not only a better location, but a better spread of buildings to allow the small alleys and courtyards it contains, which are its true pleasures, to be better appreciated. One thing I would like to point out here is that although the aesthetic profile of Caribbean Plaza never changes - unlike Adventureland, which changes at least four times - I had much more to photograph in Caribbean Plaza, which to me suggests a superior treatment. Go back to the Adventureland analysis and you'll notice that there simply isn't as much to the area despite the great diversity of visuals. Caribbean Plaza may have been done sort of on the cheap, but anybody who takes the time to wander through there and on through the queue of Pirates of the Caribbean one balmy summer evening will have little to complain about... it's one of Walt Disney World's most distinctive and gorgeous areas. One If By Land, Two If By Sea ~ Now it's 1973! But never mind that. Let's peek into the Columbia Harbour House! Yaay! 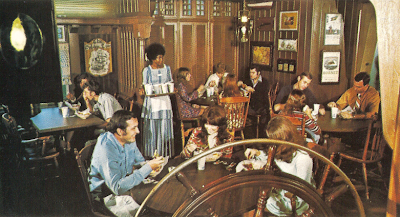 "The Columbia Harbour House, specializing in seafood dishes, is filled with the atmosphere of an 18th-century seaport meeting place, where whalers fresh from long months at sea ate hot food with gusto and downed mugs of steaming tea." ...Really? Steaming, hot tea? Did somebody make a typo? Isn't this a little risque for Disney? Did Roy O. okay this? Yikes.